The latest football news, analysis, and rankings from PFF. Featuring data-driven rankings and stats for NFL, fantasy football, and the NFL Draft. Pittsburgh Steelers cornerback Joe Haden suffered a fractured fibula in his team’s 20-17 win over the Indianapolis Colts on Sunday. After initial concerns that his season may be over, more recent reports have suggested he could miss as little as three weeks. 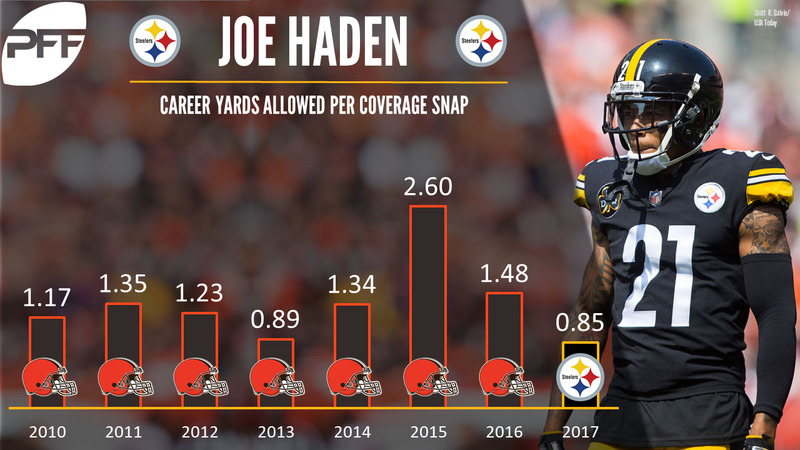 Haden was released by the Cleveland Browns in the offseason after a couple of disappointing, injury-plagued years in 2015 and 2016 which saw him earn grades of just 31.8 and 46.0. Prior to 2015, his lowest season grade had been 82.1. Having been signed by the Steelers, Haden has enjoyed something of a comeback year in 2017, achieving a grade of 80.8 through 10 weeks which ranks 33rd at his position. He has allowed a passer rating of 73.1 while allowing a reception every 16.3 snaps in coverage, which ties him for 11th among cornerbacks alongside Josh Norman. The loss of Haden will mean an increase in snaps for former Titans cornerback Coty Sensabaugh, who struggled filling in for Haden against the Colts, earning a game grade of 43.9 while allowing a passer rating of 156.3 into his coverage. The Steelers may also consider expanding the role of slot cornerback Mike Hilton, who has been a pleasant surprise for Pittsburgh this season. He ranks 19th among cornerbacks with a season grade of 83.0 and has allowed a passer rating of just 61.9 in slot coverage which ranks third in the NFL through 10 weeks.